Twigs is Tom’s best friend and sidekick – he goes everywhere with him and is the comic heart of the show. This tiny acorn sprite is like the wide-eyed, fun-loving, free-spirited and seriously silly child in each of us. Could you tell us who you play? I play Twigs, who is Tom’s best friend. Twigs lives in Treetopolis and he’s a tree sprite. He’s very small, he’s sort of based on an acorn and he can retract himself into an acorn whenever he’s frightened. But he’s a little anarchic, he’s a little crazy and he’s quite loud. Could you sum up TFT and why parents should encourage their children to watch it? I think TFT is imaginative, inventive, exciting, really good fun and it looks beautiful. It looks like no expense has been spared and I can’t wait to see all the finished episodes as everything I have seen so far has been a visual feast. It’s an incredible wonderful thing that we have channels like CBeebies that devote so much time and effort and skill to telling wonderful stories. Why did you decide to take the role? Animation is a fascinating area from an acting point of view because it’s not really like anything else because you are only providing a portion of the performance. That’s very inspiring and it forces you to do things in a different way – to tell stories through your voice. As an acting challenge it was very appealing. I think you always want to tell good stories and when you are doing something for children you are always so aware of how formative those stories will be. I was hugely formed by stories I was told as a child whether that was in a book, the cinema, theatre or television and probably television more than any medium is what influenced me as a child and formed my response to literature, story-telling and, therefore, the world around me. Can you tell us about Tree Fu and Big World Magic? There are points in every story where Big World Magic is required and Tom gets the viewers to go through moves with him and that sends the magic through to him. The idea being that the real world can influence the Treetopolis world through the Tree Fu moves. Tree Fu Tom encourages movements designed to help all children particularly including those with Dyspraxia – can you tell us more about that? I would never have imagined that a programme like this could be used in this way to help combat Dyspraxia. It will be fascinating to see if it does have a positive effect. The children will certainly have a good time trying! How did you arrive at Twigs’ voice? It’s sort of my voice but up an octave really. He’s smaller and lighter so the voice had to be higher. Also there’s a thought that for pre-school audiences you want to use higher registers in your voices. I believe that the young audience hears higher voices better. How do you gauge your performance for the audience? I feel very un-practiced in performing to an audience this young so I am very happy to be led by other people working on the show. Like getting the level of jeopardy right, what is enough to be exciting but not too much to be alarming. When you’re older you want to be scared because you understand more where the boundaries between fantasy and reality are and I suppose they are more blurred the younger you are. It’s fascinating to work with people who completely understand that audience. I’ve really enjoyed trying to understand that world. I don’t think I have ever done anything for this age of children before, a pre-school audience. Generally speaking we don’t have vivid memories of that age and what influenced us yet clearly they are hugely formative years and it’s really important that we can create television of a high quality for that audience. I think the shows you remember are from when you were a bit older. But I think the programmes you watch when you are that young, when you are still learning about how the world works are really important. It’s very exciting to be involved in something that speaks to that audience. Sophie Aldred (who plays Tom) has previously played Doctor Who’s assistant and you have played The Doctor but in this the roles are reversed, how does that feel? Sophie and I had never met before so we didn’t have any previous dynamic but I suppose that you can infer a dynamic from previous roles that we have played. As an actor you just fit in with whatever the dynamics of the characters are so she plays the hero and I’m the annoying sidekick. 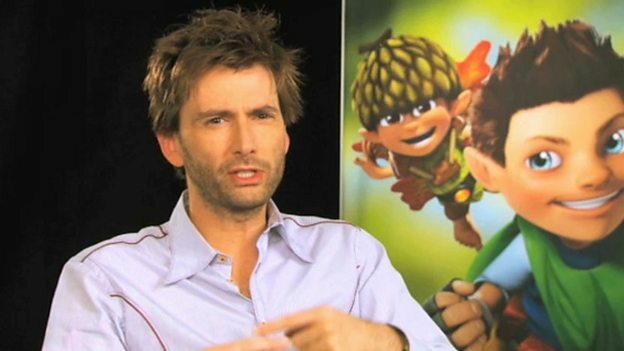 You, Tim, Samantha and Sophie all recorded Tree Fu Tom in a booth together – how was that? What’s great about the four of us being in a booth together is that you can work off each other and you can be inspired by something that someone else does and you can collectively move something in a different direction. Who’s the most animated in the booth? Probably me! I do find it hard not to dance around a bit! Twigs is quite active so it’s hard to contain that. It’s not very helpful in the final edit if you knock a script off but sometimes you just have to go for it!